Oh no its starting again. I can feel it coming on. The destructable feelings of hoplessness, fear, regret. Inability to live in the moment. Thinking too much. It's pms time again. Having such a great time in Australia I dont want to leave. I cannot bear to contemplate moving on again. I just feel like Im home. I hate being at the wrong place at the wrong time. It always seems to be the wrong time. Whenever I find true happiness I always have to walk away from it. Why?! I feel truly happy here in the 2 and a a bit weeks Ive been here. Time has gone so quick. I know I have to think about my next destination, booking flights etc etc.. but being here feels normal and right and homely. Maybe its because of the people, maybe its becasue it feels so familiar- its very similar to england here. maybe beacuse its such a beautiful sunny place. Whatever it is I must leave it all behind and head back to the other side of the world to see what awaits me there. I wonder where I will be in a year from now. If you told me last year I would be here I would have laughed. but here I am, jobless, homeless and loving it. I still wish someone would just say to me. This is where you should be: here with me. 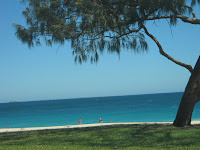 Picture is City Beach, Perth. I would like to share with you the famous poem Desiderata, which is an inspirational poem about attaining happiness in life. I find it a source of strength when am in these types of situations (trying to strive for happiness). I am sure you will find your happiness wherever you will seek it. The next day or whenever ...you will be in balance and you will know what to do with yourself -whereever you are. Someone díd say it to you and actually meant it. But maybe its that wrong time and place that gets in the way all the time.